Organic gardening for beginners. If you are new to gardening, you will want to follow these crucial tips. There is nothing more frustrating than to spend hours digging a garden bed, then planting and watering it and reaping next to nothing in produce. The right type of soil is crucial to your success, and the easiest way to get that kind of soil is through building raised beds using the lasagna gardening techniques recommended by Patricia Lanza in her book, Lasagna Gardening. In the fall or on a mild winter day, devote a few hours to building your beds by tramping down the grass and other vegetative matter and covering the area with wet newspapers. Then pile on organic matter such as leaves and moldy hay and cover it with black plastic. Come spring you'll have a good healthy soil ready for starting a vegetable garden. If you are starting a vegetable garden for the first time, you will do best by choosing vegetables that are fairly easy to grow, including tomatoes, bush beans, carrots, squash and potatoes. When starting a vegetable garden, also start your compost pile. Never put old lettuce and carrot rinds down the garbage disposal again. Instead, save those scraps, along with coffee grinds and egg shells and put them in a compost pile instead. You can add anything to your pile that is biodegradable, including manure. Just avoid meat scraps and dog and cat feces, as these will attract rodents to your pile. You can also start a compost pile indoors using worms. The compost they produce will be worth their weight in gold when you're starting a vegetable garden. Learn more here. You can make your own organic pest spray by buying a spray pump water and filling it with soapy water, vinegar, garlic powder and cayenne pepper. Mix these ingredients together give your mixture a good week or so to completely dissolve before using for the first time. (Otherwise the cayenne and garlic powder are likely to clog up your pump). Spray around the base of each plant once a week to discourage beetles and other pests when you are starting a vegetable garden. 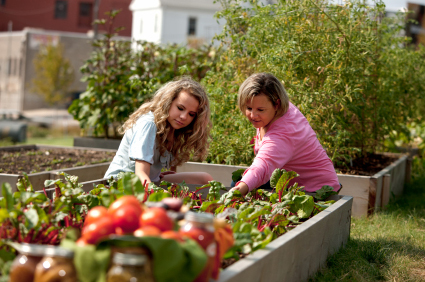 Before starting a vegetable garden, spend some time thinking about the location you want to use. You will want a spot that gets plenty of sun, but is also convenient to get to every day. A vegetable garden that is close to your back door is likely to be weeded more. Better still, plant your garden right by your front steps. You'll be encouraged to pull a weed or two every day after you get home from work. Pollination is crucial to starting a vegetable garden that will provide you with a bountiful harvest. If you have done everything right and your garden is still not producing many vegetables, the answer may be a lack of bees. Having these wonderful little insects around are crucial to a successful garden. The best solution is to keep bees yourself, but that's not always possible, especially if you live in an urban area. But what you can do is plan on planting some flowers along with your vegetables to attract more bees to your garden. When starting a vegetable garden, plan at the very beginning to attract more bees and butterflies to your spot by choosing non-hybrid flowering plants that are native to your area, and plant them in clumps throughout your garden. Provide your bees and butterflies with different types of flowers in a wide variety of shapes and colors that will flower throughout the season.